The new planetary gearbox series from Framo Morat includes the high-end gearbox lines GSD (flange gear), GSB (inline) and GSBL (angle gear) as well as the high-end economy GSN and GFE lines. Particularly suitable applications for the new range are those which place the highest demands on positioning accuracy, operating noises, running smoothness, bending rigidity and transmitted torque. The planetary gears are designed to meet the highest production requirements — all lines are equipped with precision ground helical gearing, single-piece planetary carriers and full needle bearings. The GSD, GSB & GSBL high-end gearbox lines are constructed in a space-optimized, two-stage design. Due to the lower torque values, the input stage is dimensionally smaller than the output stage. Its short design makes the GSD line the ideal high-end gearbox for space restricted applications. 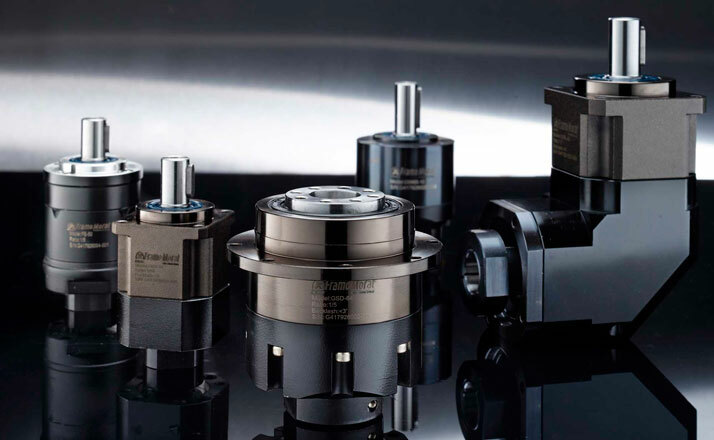 The low standard backlash of the GSD line makes it the perfect fit for highly dynamic applications where highest positioning and speed accuracy is required. The flange output produces highest torsional rigidity. For the accommodation of particularly high axial loads, taper roller bearings are optionally available in sizes with 90 mm diameter or higher. The GSB line stands for high performance in combination with low backlash and high precision. Its robust, one-piece housing allows for a high gearbox rigidity and the absorption of high radial and axial loads. The angular gearboxes of the GSBL line offer the same advantages as the GSB line; the right angle shape makes the GSBL line the perfect match for all dynamic applications where space is limited. The high-end economy lines GSN & GFE combine high performance with economic efficiency: both lines are also equipped with helical ground gears, ensuring a minimum noise level and smooth running. The full needle bearing has been especially designed to reach high torques that beat the competition for units of the same size. All planetary carriers are manufactured as a cage made from solid material. This increases quiet operating characteristics while at the same time improving positioning accuracy and reducing backlash. An additional shaft sealing ring ensures maximum dust and splash water protection in accordance with protection class IP65 in all lines.